Very effective, 26’’ in diameter, blowing at a speed of 950 turns/min. 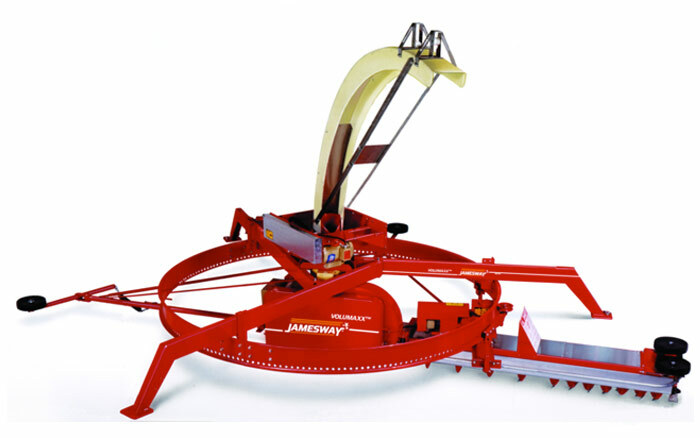 With autocleaning, reversible and adjustable cutting blades, the V widened to a U shape design, gives it increased resistance, extensive durability, all the while permitting the COMPLETE evacuation of the silage, preventing from premature wear of the auger head; made of stainless steel. The ball bearings are covered in ABS to eliminate corrosion and protect from dust particles, its position makes it easily accessible for maintenance and lubrication. The back: the area most critical for corrosion is made of 10 gauge stainless steel with AR400 steel alloy, multiplying to a MAXXimum its lifespan. Top of the line unloader: a system permitting up to 35% greater filling capacity and more adequate fermentation by evenly distributing the silage, permitting to deliver your very best feed from the entry to the exit. 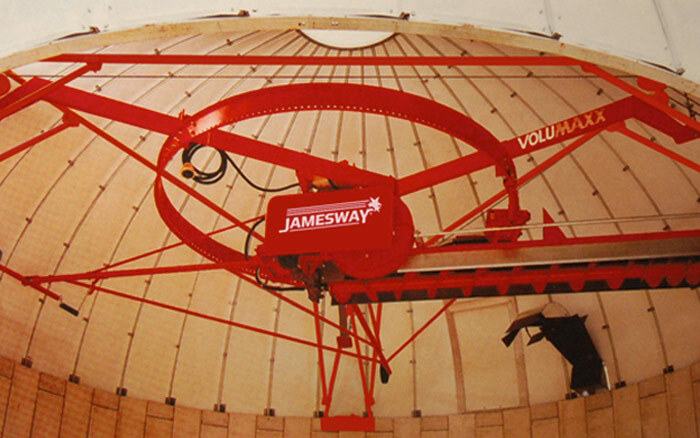 MAXXImum Stability since it takes its fulcrum from wall to wall using the whole size of the silo, eliminating inconveniences, such as encumbering adjustment weights, etc. Like a drill that is not fastened in place but well welded on a tree of 4’’ in diameter, its wings of 10’’ in diameter by ¼ thick, are double layered over a length of 30’’ for MAXXimum effectiveness in the harshest conditions. And for the worst of conditions, (in option) blades that are curved and sharpened are also available for use in strategic positions. 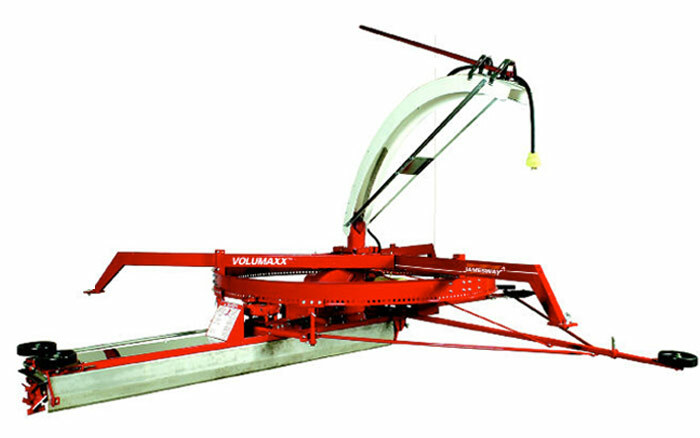 with an angle of 16’’, the blades work the silage in the auger towards the center of the tree, more easily without effort, for MAXXimum efficiency. Results: the unloader requires less energy therefore, premature wear is prevented. Volumaxx, the result of 60 years of Jamesway® experience and state of the art engineering in terms of power and performance. The objective of crown ring driving is to transmit the traction power to the ring, and with the hexapod, to maintain the surface level so that the trough can do its job. 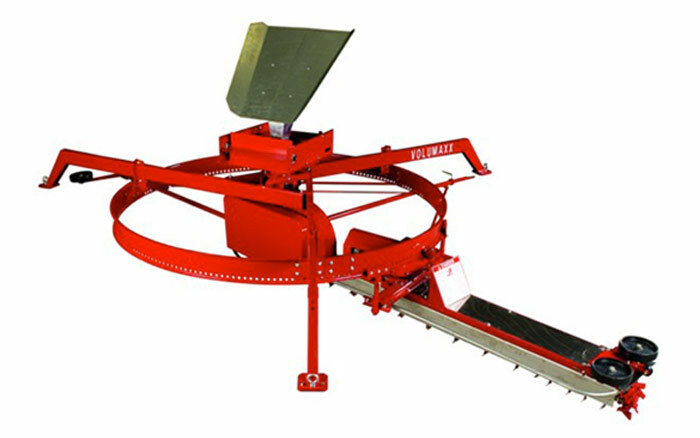 the trough can therefore drive, sort, and carry the silage flow to the blower with highly concentrated power. Powermaxx distribution system covered with teflon for better silage sliding.